It's a conditioned response. The ball leaves the pitcher's hand striking the catcher's mitt, and before the echo of ball-hitting-mitt dies out heads all around the park turn and search for it. Perhaps it's hidden in the electronic maze of the scoreboard or camouflaged next to an advertisement. It might take you a minute or two to find it, but it's usually there. That damned radar gun. Believe it or not, there was a time before the radar gun existed. Players, coaches, and fans alike would watch every pitch intently. The way it came out of the hand, the plane that it traveled along on its way home, the swing a hitter put on the ball, and the sound it made as it reached its destination. These were the only indicators of what kind of "stuff" a pitcher had. 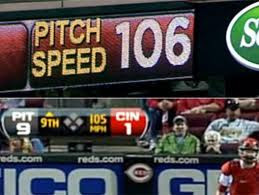 Whether it was 85 or 95 mph, a fastball was judged on its effectiveness and not only its velocity. Hitters would use terms like sneaky, deceptive, or just plain hard. I've heard coaches say that if they were playing in today's game they would never have gotten drafted. Their fastball never topped out as hard as most pitchers today, but they could pitch and get guys out. That mattered more. I remember going to my first college showcase. Coming from a small high school where I was rarely, if ever, put on a gun, it was intimidating seeing 15 radar guns held high as I threw a bullpen session. Feeling like I threw well, I finished my bullpen expecting to talk to some of the big school coaches. No one budged. I then went over to look at a piece of paper that had been posted on a cork board near the locker room. It had 4 columns. Fastball, Curveball, Slider, Change-up and velocities for each. No fastball of mine topped 90 mph. Right then and there I realized my chances of playing SEC baseball were slim...to none. It was a bad feeling knowing that I had performed well in games, thrown all my pitches for strikes, and was probably heading to and NAIA or D2 school. I made it through college, gained a couple mph, and was fortunate to get drafted (I like to think it was more on God and my ability to pitch and less on my 92 mph fastball). However, that was just the beginning of the radar gun circus. In pro ball, as I said earlier, there is a public gun at almost every park. It usually sits in plain sight for every Joe Schmo to see and judge. It's a shame, but if a guy goes out there now and throws his fastball 86 mph people snicker and use names like "poo baller" or the more polite, "crafty". I would be a hypocrite if I said that I never do that too. I can feel it in my bones. The pitch comes and my head, despite how hard I try to keep it still, turns to find the radar gun so that I can present my judgement of said pitcher. It's a disgusting habit. I'm trying to quit. Don't let me trick you readers into believing that there is no value to having radar guns. They can be useful for many things. If a guy throws a cutter it can be effective to see the speed difference between that and the fastball since both stay on the same plane. Guns also serve, in some cases, to indicate injury or fatigue. Though not always, pitchers will sometimes drop velocity to protect their arms in nagging pain or in physical fatigue after a large workload. But the reliance on the radar gun as an indicator of future success makes the basest of assumptions and generalizes them out unfairly. For the slower throwing pitcher it creates a chasm over which he must leap to get to the major leagues. He must show "extra" ability to command and develop pitches because his fastball just won't cut it by itself. True statement, but incomplete. The fact is, even the flame thrower won't be able to make it on that pitch alone. He too must develop and learn how to pitch. This puts unreasonable pressure on him too. Simply because he has been given the ability to throw hard does not negate the fact that he must learn the nuances of pitching. Unfortunately, he usually must do so at higher levels, often exposing him to failure and waning confidence. You see it all the time. More so than all of that, however, is the sheer annoyance of hearing "how hard was that one?" 85 times a game. I feel like we, as players especially, have lost the ability to watch a game the same way. We've forgotten how to appreciate a BP fastball in the mid 80's, or a mediocre fastball thrown to a good location on a downward plane. That's pitching, folks! Ok, seeing this on a radar gun is kind of amazing, but let's get real. You're not going to see that very often. I vote that we fight our modern game instincts and our neck rotations, and watch one game without looking at the gun once. See if you find out anything new. It might surprise you. Glad to come across your blog, and I have to applaud the clarity of your writing. You're a very articulate athlete. No doubt that college education you got on your way to the big leagues was worth something. I like your thoughts on this, but there is something to be said for velocity. I'm a giants fan, so I'm thinking of Barry Zito here. I really want him to succeed and think he's a great guy, and I do credit him somewhat for the success of the other pitchers in the giants rotation that have developed under his watch. Nonetheless, he was an effective pitcher when his fastball was around 89 and he located it well. After all, his curveball is what he's famous for. But now, with an 84-86 mph fastball, he has a tough time getting hitters out, and when he wasn't on the dl this year, he was prone to throwing 84 mph cookies down the middle of plate when he got caught in a hitters count. These cookies were quickly crushed into the bleachers. However, look at Cliff Lee and Matt Cain. Both have a fb that sits at 91, but can be pushed up to 93-94 when necessary, and they are two of the most effective pitchers in the game, and any team would rather have either of them than a young guy who throws 97 but doesn't have a track record of putting in 200+ quality innings and 25+ quality starts year in, year out. Results are ultimately what matters. Best of luck to you, and keep writing.